Putting this together was quick and easy. 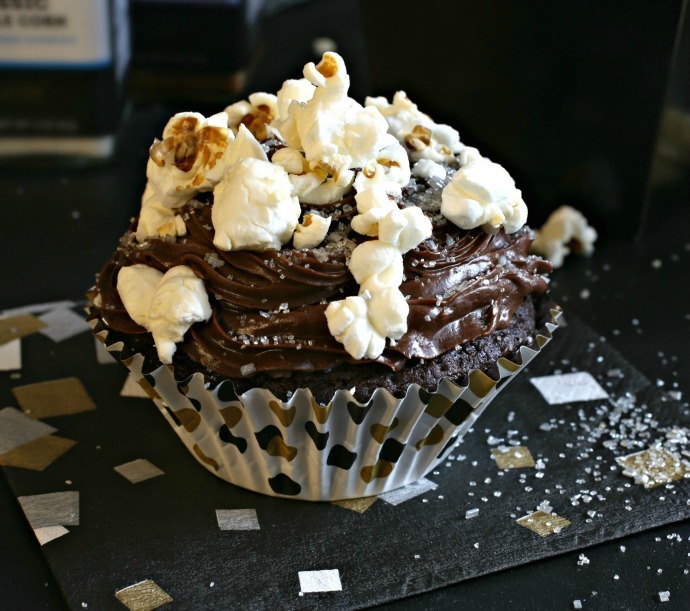 A fun shopping trip to a local party supply store to pick up some black and gold napkins, cupcake liners and popcorn cups and a stop at the grocery store for some good popping corn and my favorite chocolate cupcake mix. The sorcery of the popcorn balls required some cooking and sticky handling but my friends and neighbors devoured every test batch I made so they were worth a little work. Did I mention they're sticky? 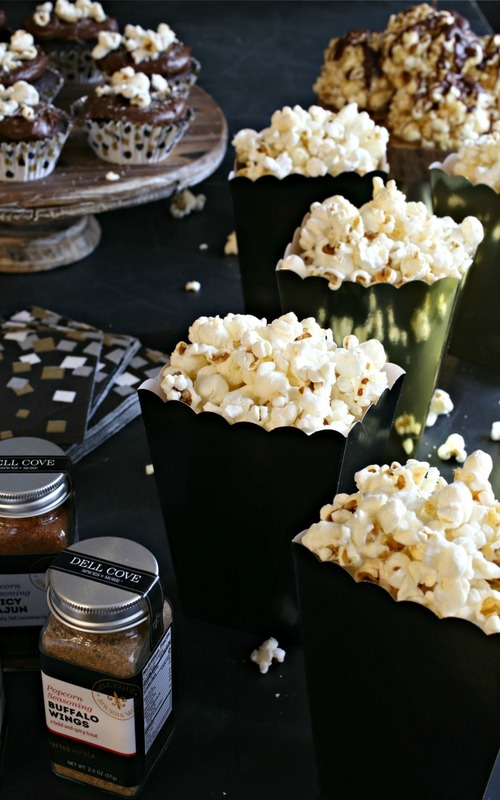 The key to the DIY popcorn bar is to have a good assortment of toppings. Dell Cove Spices makes at least a couple of dozen fun options so the hardest part was choosing what to get. I went with a mix of sweet and spicy. 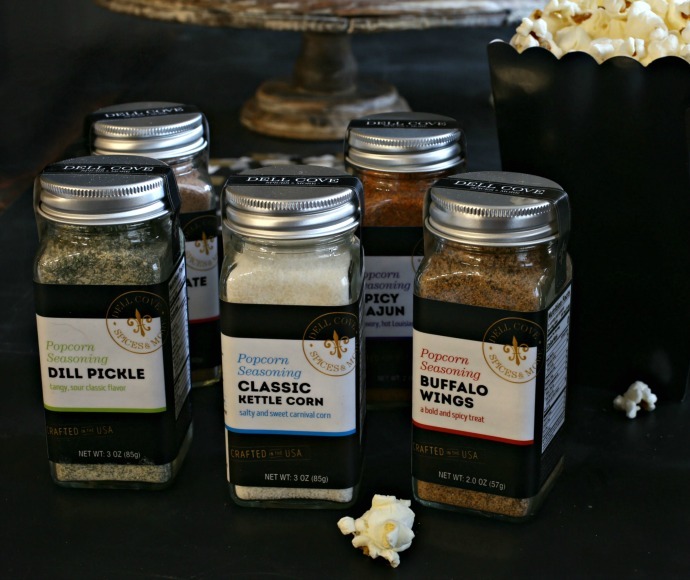 From the expected, like kettle corn seasoning, to the fun dill pickle spice. Because why not have some fun, right? Even the cupcakes got a touch of chocolate caramel seasoning and a sprinkle of sparkling silver sugars. Because I can't resist the combination of sweet and salty, I pretty much owned that bottle of kettle corn spice while I worked my way through the popcorn. Next time I think I need to add the salted caramel seasoning to my collection. Enjoy! 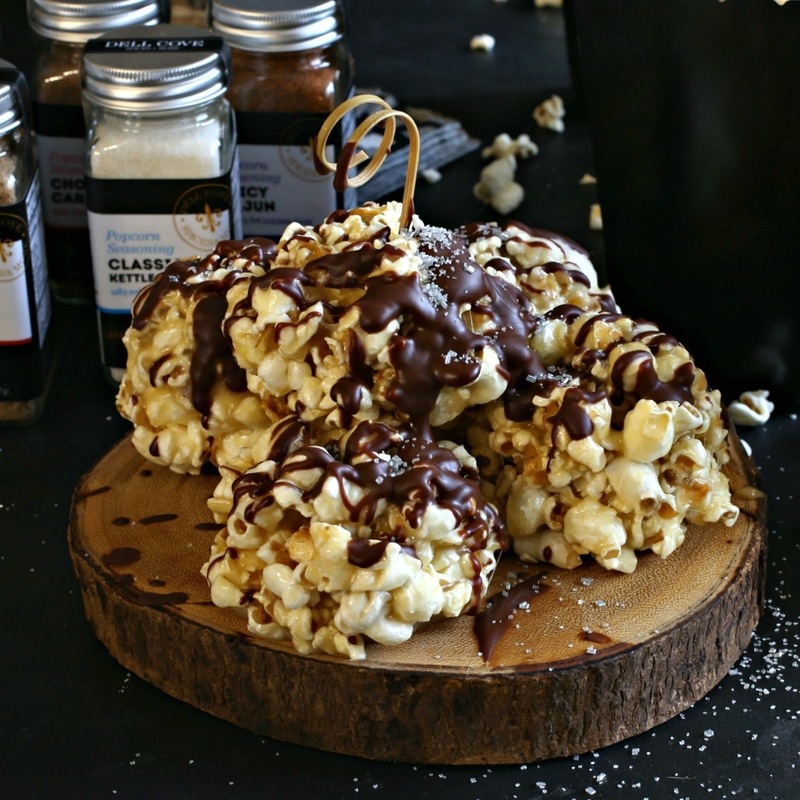 Recipe for sweet popcorn balls drizzled with chocolate. Add the sugar, corn syrup and water to a large pot and simmer on medium low heat, stirring often, until the sugar has dissolved. Stir in the butter, vanilla and salt until combined and then stir in the popcorn. Note that you need to let the popcorn cool before using a 1 1/2 oz. scoop to form the balls or they won't hold together. 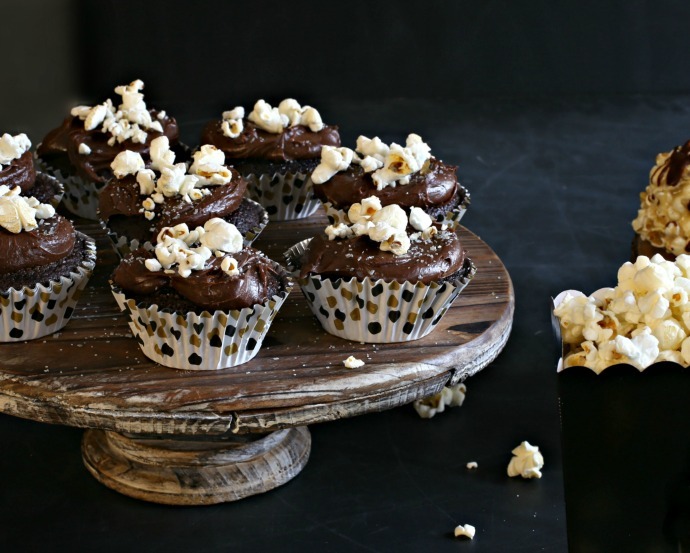 If the popcorn cools too much to scoop, continue warming it slight and cooling back down. Melt the chocolate chips in the microwave and stir in the butter until smooth. 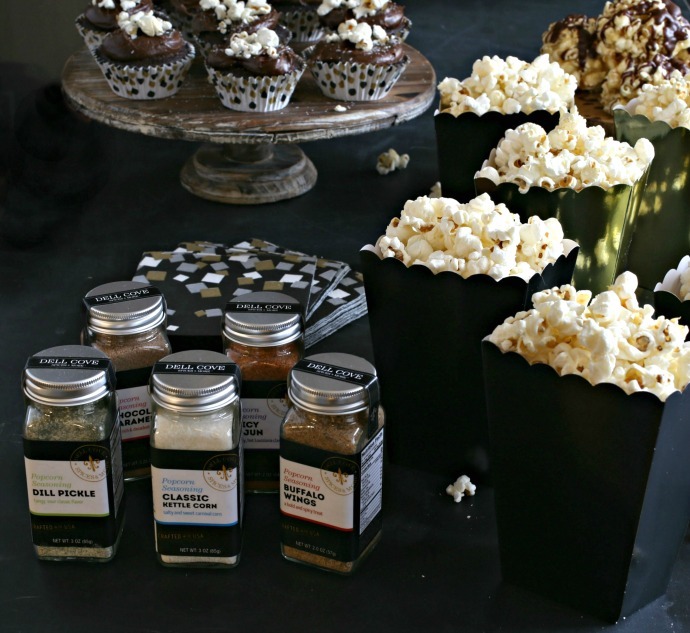 Drizzle over the finished popcorn balls and serve with assorted seasonings.